Navy blue, that is. The navy sportcoat got worn yet again today. I conglomerated it with a white straight collar pinpoint dress shirt. 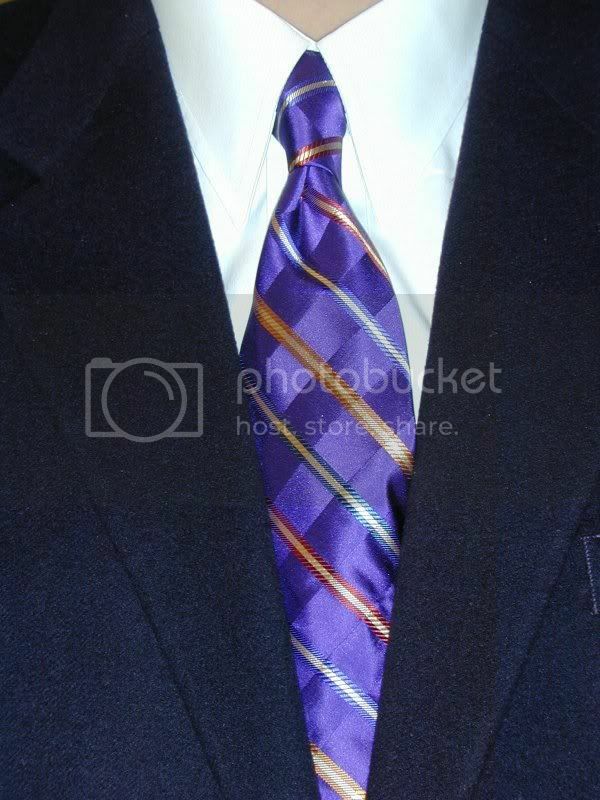 The necktie is another Jos A. Bank Signature Collection number. I got it online from Jos A. Bank but for an extremely reduced price of about $20. It's got a purple background that's woven to look like tonal stripes. Over the top of that it's got multi-colored stripes that go diagonally in the other direction. It's a pretty cool tie that I wore for the first time today. It was a little thin to fill in the tie space so I tied it in a Prince Albert knot. That's the same as a four-in-hand with one extra wrap around the front. It bulks up the knot a bit but it also elongates it too. I like the way it worked out with this necktie. Ever wonderd how many tie knots there are? Try this site for a few more. They call today's knot the Victoria. Brooks Brothers' site calls it the Prince Albert. I'm not sure whether I'd rather it be named after a female or a male. So long as it's named after royalty, I guess?